Pick Up Your Mug & Journal This Sunday! This year, our 40 day spiritual adventure comes with an opportunity to experience your devotional time in a new way! We will be asking God to INCREASE Christ in us, with renewed strength and energy in our lives. With this in mind, Westheights is offering a custom-made journal and mug ~ the perfect combination for making space for God. Take your Bible, the journal and your favorite drink; then push away the demands of life for a few minutes in your day or week. This is an opportunity to approach scripture with a new perspective, so find a different time and a new location and discover fresh ways to meet with Christ. 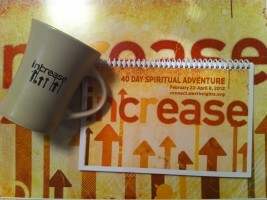 The mug and journal set will be available this Sunday for a suggested donation of five dollars.